Steel bearings are generally coated to enhance hardness, wear resistance, and anti-friction properties. The coating also provides the bearing with better corrosion protection and cosmetic appearance. All of these qualities lead to an improved performance and service life of the component. 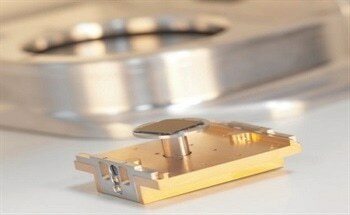 Thermo Scientific K-Alpha X-ray Photoelectron Spectrometer (Figure 1), an integrated XPS tool, was used to test bearings with a steel base and a lead/tin eutectic coating, with a thickness measuring >100 nm. It was used to identify the chemical and elemental composition of stained areas on split steel bearings. The staining on the bearings occurred after shipment from the factory. The stains did not greatly affect the performance of the bearing, however customers were dissatisfied by their appearance. XPS is a fast and non-destructive technique, developed to characterize surfaces. 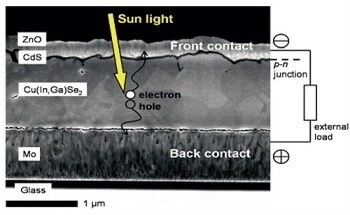 The technique is quantitative and responsive to alterations in chemical state, it is also extremely surface sensitive. 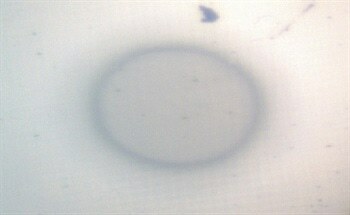 In this case XPS was used to detect the chemical changes between the normal areas of the bearing and the stained areas. The K-Alpha system has point-and-shoot capability, which can be used to identify the chemical and elemental differences between the stained and unstained parts of the sample. 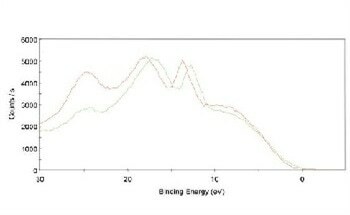 Wide scan survey spectra were obtained on three points of the sample that looked optically different. 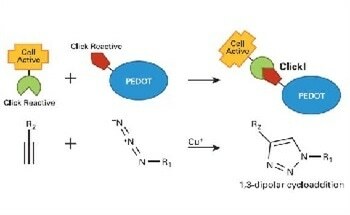 The K-Alpha system’s unique Reflex Optics system captured images of the sample as seen in Figure 2. Then the points were tested for chemical differences by obtaining narrow region spectra. Finally the sample area was mapped after rastering the sample stage under the X-ray beam, and gathering 128-channel snapshot spectra at each imaging pixel. 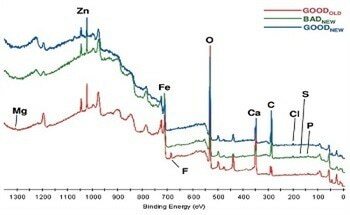 Figure 3 displays the survey spectra where major differences were noticed in the relative amounts of tin and lead in the unstained and stained areas. The quantification table (Table 1) shows that more tin was found on the unstained areas than on the stained areas. Different compositions of lead/tin eutectics tend to possess slightly different appearances, and this stained appearance could be due to the different composition of the eutectic coating of the bearing. The stained area also has considerably more carbon, which could influence the appearance of the surface. 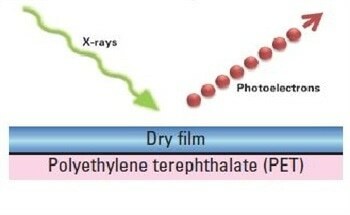 Figures 4 and 5 depict the chemical state analysis, using high resolution Sn and Pb spectra of the unstained area, which revealed a mixture of lead metal and lead and tin oxides. 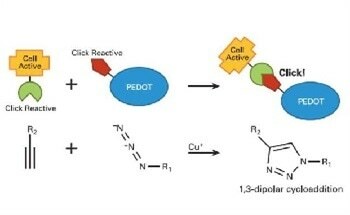 Major differences in the relative amounts of chemical states were detected. The lead was nearly completely oxidized in the stained areas, which have very low tin concentrations. 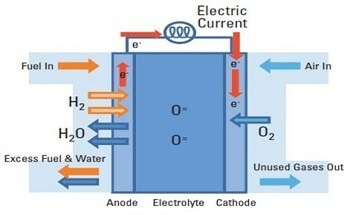 The underlying lead can be protected from being completely oxidized by forming a tin oxide coating in the unstained area within the XPS sampling depth. However the stained regions do not have this protection. 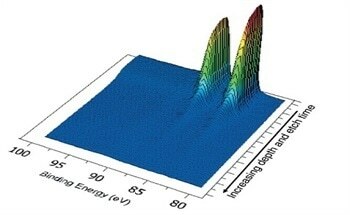 XPS maps of the sample depict the distribution of the chemical and elemental states across the bearing surface. 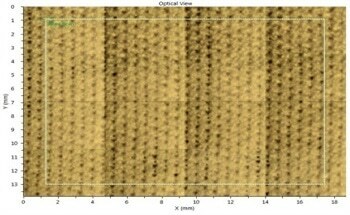 Quantified imaging of the bearing surface validated the higher levels of lead oxide and carbon on the stained areas. Avantage software is K-Alpha’s data system, and it allows the user to build concentration ratio maps. 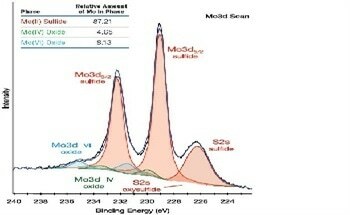 The map of tin to total lead ratio reveals the correlated difference in concentration of these two elements (Figure 6). 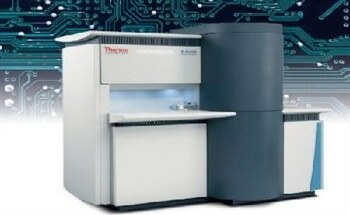 The Thermo Scientific K-Alpha X-ray Photoelectron Spectrometer was successfully used to evaluate stains on steel-based bearings. The technique was direct and simple to detect the differences between unstained and stained areas. High carbon, low tin, and high lead oxide concentrations were observed in the stained areas. 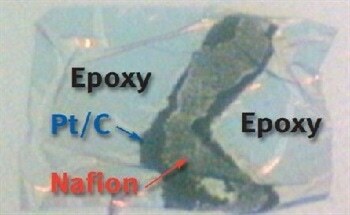 The XPS results match the number of possible causes for the staining, such as issues with the eutectic before deposition or the method by which the eutectic was deposited, deposition of a carbon-based contaminant, or loss of a protective layer that allowed corrosion to occur in that area resulting in the stain.